After forty years in the brutal desert, God will finally allow the Israelites to enter the Promised Land. Moses’ time on earth is fading. He makes his final speech to the Israelites, recounting all that their God had done for them, and tells them not to blow it again. That forty year trip should have really only taken them 11 days. That’s right, eleven days. Deuteronomy 1:2. Why did it take them so darn long? Ten of the twelve men sent to spy out the land they were about to fight over were terribly worried. Their worrying was rooted in their lack of faith to follow God’s orders, and move forward to take the Promised Land. They forgot how the Great Lord their God had been with them all along. They forgot about His protective cloud that sheltered from the scorching desert sun by day, they forgot about the pillar of fire that served as the world’s most colossal fireplace those chilly nights, never needing stoking. They forgot how God delivered them from 430 years of slavery with immense plagues and miracles. They forgot the parting of the Red Sea, and that they saw the Egyptian army chasing them washed away by God’s almighty hand. They forgot His providence of bread from heaven called Manna, quail, and water in the midst of the unforgiving desert. They plainly forgot. They cowardly shook in their sandals with worry over the size of the men in the land they were supposed to conquer, even though God told them He would conquer the land for them. All He asked from them was a step of faith. 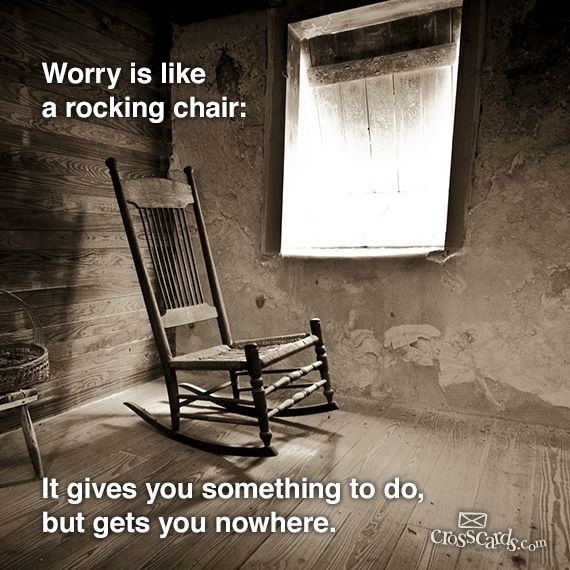 Worry is the opposite of faith in God. There’ve been plenty of times my faith waivered when I felt like the grasshopper in the land of the giants. I am going through one of those times right now. It’s been a strenuous three weeks now since I have been dealing with sciatica. For those who don’t know, the sciatica is the very large nerve that goes from near the sacrum area (the place on a human where a tail would be) all the way down the leg to the foot. My back has been somehow tweaked to the point I have a constant Charlie horse that tortures me any time I walk or stand. I have dealt with anger, frustration, dismay, agony and plenty of worry. It seems impossible not to worry about this nerve and how long the pain will last. I read that it could go on for months. MONTHS! “It will take some time but it will get better,” My chiropractor said. Some time, that’s what worries me. I have exercises to do. I am to keep more active. Sitting further aggravates sciatica. In my extreme distress, I struggle to trust God and worry this nerve will receive permanent damage. But when I come to my senses I know I have to keep trusting God that He is the God that heals, and that I need to continue to trust Him for this healing. I find myself being grumpy and agitated; It seems impossible to be cheerful and joyful when I am overcome by the pain. Testing of your faith he says. There is that faith word again. The Bible says that our struggles are meant for God’s glory. But in the midst of trials that is hard to take. O Lord, please strengthen our faith, deplete our worries. We desire joy, please uplift us when we lack your joy. Describes most of us, most of the time “slow in faith and quick to worry.” I add my prayers to those of others that you you will be quickly released from pain. My waking thoughts this morning were filled with the sight of a little bird, set free, hopping around and singing as little birds do when all is well with their soul. Your post is a lovely song.. you may be in pain for a little while, but all is well with your soul. Thank you. Amen! Thanks for the prayers. Isn’t that the truth, we can just about endure anything when our soul is at peace! I don’t like that you are in pain Elizabeth and I pray that He will release the pinched nerve; but I do like your encouraging post. To God be the glory. Thank you poetrycottage, and Amen!